For the Love of Books–Why Doesn’t The World See It? Now this may seem a little rash, especially considering everyone on the planet may not share my intense love of reading, but why do people cringe when you say you like to read? I mean, honestly, I must have slept in the day that the universe voted in reading as the most un-cool thing a person could do. I recently heard a conversation between two people discussing the Harry Potter books. The guy in the conversation commented on how he couldn’t get involved in the movie because he didn’t understand the point. My inner self cringed at the statement because it was so simply incorrect. How can a book designed for 10 year old’s be too difficult to understand the simplified movie version? Ignoring the blatant silliness of him comment, the girl responds that she doesn’t get the movie either. Well, DUH! Read the book first! Alas, I feel like I am simply talking to myself in this regard because these kinds of people don’t read. They don’t have time for it or they have better things to do. What could be more entertaining and enjoyable than escaping into some other life, some other world for a few hours. Here are a few quotes that explain exactly how I feel about books and why other people should too. It is just simply necessary, so much that once you start reading you shouldn’t want to stop. I bring a book to work every day and read during my lunch because what else do I have better to do to fill the empty moments in time than to open my mind up to the hundreds of possibilities that books have to offer. While it may sound a little extreme to call reading a drug–it is! As many book lovers know, it is so easy to get sucked into the world an author created that you almost lose your will to do anything else. You eat, drink, dream about the story. It’s as if a movie is playing continuously in your head until you are done with the book, and then you start a new one and the cycle begins again. Unlike drugs, there is no downside. I wish I could show the non-readers how truly fantastic a story can be in your life when you have become so immersed that your emotions overflow into laughter, tears, and even yelling at the book. Not only do books provide the best entertainment possible because of their limitless possibilities, but they provide a primal need in all of us to escape from the harsh realities of life. Books release you from the obligation of responsibilities, sometimes even providing insight into life’s problems. It provides closure to the heartbroken/grieving, provides a sense of companionship in similar situations, and lastly a sense of wonder in the human condition. Even more importantly, books are common interest for so many different people that it could potentially be an easy way to find a significant other, but most people find reading an unattractive quality. As it has shown over time, women were not allowed to read and it was frowned upon when they did. It doesn’t make much sense to oppress people’s wish to read, but it seems like we are backtracking into older, less intelligent ways by looking down on those that choose to read in their spare time. Sad, but true. To me, one of the best dates I have been on in a long time is when my boyfriend and I went out for lunch and he suggested going to the book store afterward. I was thrilled, since he is normally a non-reader. We ended up spending an hour or two in Barnes and Noble browsing the book section and my boyfriend even picked out a book. Although he would rather have me read the book than read it himself, he is open and admires my love of books. Our date concluded with me reading two chapters of his news book on the way home from the store. I simply have such a irrevocable love for stories and the people who write them that I feel it is my duty to show how truly astounding books can be. It is not just a hobby, part of my job, or entertainment. It is a way of life–a part of your soul, to have the many characters of books influence the way you think about your choices and emotions. There is a permanent impact that books make on a person’s life similar to the adorable tattoo shown above that is undeniable to any avid bookworm. Books make life exciting, they thrill, teach, amaze, and change people with simple words on a page/screen. I only hope that this age of “reading is dumb or uncool” starts to fade with the introduction of massed produced e-books and e-readers to bring back a much needed revival of the love of book reading. Happy reading and writing! Just a reminder, book are our friends show them some love and read them! So, I think it’s time for me to confess my love for Edgar Allan Poe. As sure as I am a lover of books and aspiring writer, I have loved Poe from the moment I picked up a middle school edition of his short stories. Inside this book, I found the magic of Poe’s writing. He was a legendary literary critic, poet, and author. I say legendary because his ideas have surpassed just becoming classic literature. They have become a basis upon which people can appreciate writing for its truly powerful purpose. Even for those who “don’t read” they know Poe’s reputation. He is one of the most famous and revered American authors to date (if that isn’t a fact–it damn well should be). Like all great writers, he has dabbled in a bit of everything, but eventually settled into what he was destined to do. Write horror. He is credited with many contributions to mystery, horror, detective fiction, and science fiction. Without Poe, the genres detailed above would not be what they are today. He allowed readers to see inside the human mind, and wasn’t afraid to highlight the frightening parts. 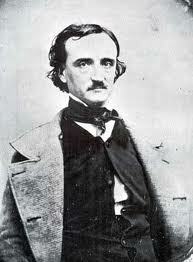 Yes, I’m talking a big game, but that is only because Poe walked a pretty big walk in his time on Earth. I believe that my love for Poe began when my 8th grade teacher had a week dedicated to Poe and we read “The Raven.” Cliche to read “The Raven” first? Probably. However, it was the best possible poem to introduce Poe to me. I proceeded to learn everything I could about him, and fell in love with his stories. I cannot claim to have read them all. At the same time, though, some of my favorite stories are his or come from his influence. Part of my love for detective fiction stems from that heart-racing mystery that Poe provides in many of his stories, which is probably what brings me to my next topic. Pop culture. Dread it or use it, pop culture has an effect on the public. It can enlighten people as book movies encourage people to read, or it can scare people away by the out-of-date references of the past. For Poe, nothing has helped more than the pop culture influence he has bestowed upon the world. First, let me take you back to an episode of Syfy’s Warehouse 13, which utilizes the power of word to bring Poe to life. I recently watched the episode in season 1 titled “Nevermore,” which features an “artifact” or supernatural item that must be contained by the main characters Myka and Pete in the show. 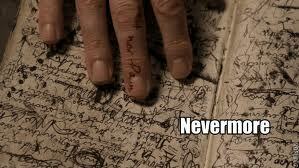 What they create in the show is a notebook and pen used by Poe that hold the power of his words within them. The notebook causes the possessor to fuse with the words on the page and create a link between the text and the person in possession of the pen. 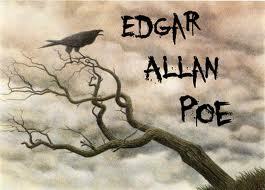 It is a painful process to be so close to the words of Poe that it almost kills the man. The pen, however, holds the power. It allows the person who holds it to recreate the stories of Poe in real life. A pendulum, trapping a man in a wall, and forced love are some of the disastrous effects of Poe’s writing in a young boy’s life. The episode brings the two together to solve the supernatural issues going on in the story, and the overall message is—Words have power. The simple fact that the writers of this tv show chose Poe is not a coincidence. He has always had a very powerful connection with the words he placed on paper. He has influenced me, and some of my favorite authors to delve into the darkness sometimes. 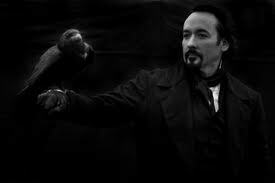 The movie--The Raven featuring John Cusak as Poe himself! The Raven will be coming to theaters very soon, and I anticipate its arrival. The scene is set–Poe must help the police find the suspect behind murders copying his stories to clear his name and stop these horrifying killings. Sounds spooky and fantastic to me. Any chance I can have at seeing great writing on the big screen in an inventive way, I will TAKE IT! You see, I have faith that this movie, like Hunger Games, Harry Potter, and many others will spur some in the audience to go back to the books before/after watching the film. It is an opportunity to show the world how exciting and powerful the written word can be as well as those who write it down. Normally, I don’t focus on a famous author, but I have a sweet spot for J.K. Rowling, the writer of Harry Potter. As a child, I grew up as Harry did while reading the books. Later in my undergraduate classes we discussed how Rowling revolutionize young adult literature. With an epic series of fantasy and coming of age, who wouldn’t want to see what she has coming up next. According to CNN, Rowling has an adult book in store for readers worldwide. After the stunning growth of her characters and her writing, there is a lot of promise in this new book. Most people in the publishing biz don’t expect her to receive the same success as HP. I, however, have an optimistic approach for this book. Maybe it’s because I enjoyed the development of the HP series, but out of courtesy to another writer I believe we all can develop in different levels of writing. The switch from young adult to adult may be difficult for some writers. There is a huge difference in the themes and style of young adult that make the literature part of that genre. According to the article, Rowling’s editor of choice is known for crime thrillers giving a hint to the book’s contents. The rumor is that Rowling’s setting will be her hometown of Edinburgh, and she may be writing a whodunnit. I am thoroughly excited about this because I have a special place in my heart for crime novels. It is important to note that having new books by well-known authors may help the publishing industry. With a name like Rowling on a new book, people may stop and buy the book. We will have to wait for the book to come out to be sure, but the anticipation for Rowling’s new book definitely has me inspired. Recently, I purchased a few books from an awesome bookstore in Pittsburgh. 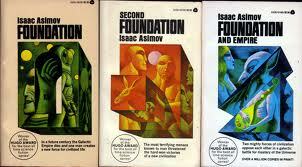 I was excited to start reading because I had found two books from the genius science fiction writer Issac Asimov. Since I hadn’t read many classic science fiction writers, I saw the books as an opportunity to learn more about the genre. Noticing the word “Foundation” as one of his best pieces, I picked up two books. One problem. The ignorance of my purchase was validated when I picked up the book, Foundation and Empire to find that it is the second installment in the trilogy. In addition, I had purchased the third installment, Second Foundation, which was sitting at home waiting to be read. I have the two books on the right: The ones with the orange and blue cover art. How could I begin the series without the first installment? Well, folks here is the kicker. I have a secret habit of reading most new series out of order. You’re probably thinking: Just go and buy the other book you need and then read it. My response: Why should I wait to read the story when I have two perfectly good books right here? I can go back and read the beginning of the series later. This mantra has consumed my life for as long as I remember. I pick up a book, read the entire thing, then find out there are three other books that come before and after it. This accidental out of order reading has happened so often, I have accepted it as a normal habit when reading books. It is rather comical going back, and thinking about what book series I have read in the most interesting order. Let me take you back to the first time I read a book in a series out of order. It’s 1999, I’m 10 and walked through Kmart or some department store. I’m with my dad when I notice the following cover of a book. It’s a thick book, but up until then I hadn’t seen a good fantasy novel that caught my attention. I asked my dad to buy the book for me, and by the end of the trip I was at home reading it. Now I might have known about the series if I paid attention to the news, but the internet wasn’t as instantaneous or important to me at 10 years old. No, I read the book cover to cover, never knowing it was the third book in a series of seven. How can a 10 year old say no to that?! What book series, you ask? Harry Potter. 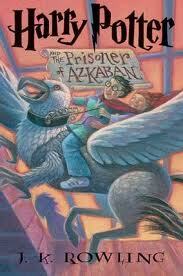 The book, Harry Potter and the Prisoner of Azkaban. I was hooked on the story, but didn’t have any more of the books to fuel my addiction. Slowly I began collecting the other books (in the right order from that point) so that I could read the entire story of this boy wizard. The funny thing about reading a series out of order is how your perception of the story changes. As you acquire more information, the story shapes itself like clay being molded rather than a flower unfolding. For most of the novel, I thought Harry Potter was actually Neville Longbottom because he gave a fake name while getting on the Knight Bus. Try thinking that the main character is pretending to be someone else, then going back to read the first book to find out he’s someone entirely different. Even at a young age, I loved piecing together the story line rather than just read it in order. Let’s jump ahead to high school. I spent as much time as my schedule would allow in the library. Like any good bookworm, I sought after compelling books to take up my waking hours. As I searched though the stacks I came upon the final book in Piers Anthony’s Incarnations of Immortality series. You see that one down there on the bottom right? That's the book I chose to read first! Anthony is one of many fantasy/science fiction writers that inspired my career today, but our relationship started out a little hazy. Like I said, I picked up the book And Eternity, thinking it was a standalone novel. I was impressed to find that it was the final part (well, now I know it’s the second to last book because he added another one on and I just found out) of the series. I wouldn’t figure this out until I picked up the 5th book in the series of 7. 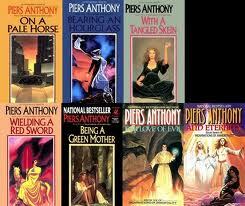 To save time, I will name in numerical order how I read the series: 7,5,1, 3,2,4,6. I know, I know, it seems like the weirdest way to read a series, but it worked. The shock when I discovered the connections between book 5 and 6 were much more drastic than if I had read them in order. The discovery of connections was confusing at first, but eventually became a satisfying result. It may seem as backwards as reading the series in reverse, but the adrenaline rush I received from putting the story together is incomparable to reading it in chronological order. Also, the fact that I have found an additional book in the series I thought was finished makes me incredibly excited. Check out the middle book in the bottom row. Doesn't it look appealing? Moving on to a more recent trip down out of order lane, I was perusing through the fantasy section of a book store when I came upon this series. It was clearly stated that it was part of a series, but I had no clue in what order. Like most chain bookstores, they might have two or three selections from a series or from the author. In this case, I picked up what looked like the most appealing cover matched with the back cover blurb. 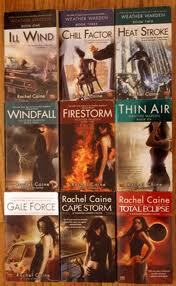 Again, I had chosen the second to last book in the series, Cape Storm. Did that stop me from reading it? Hell, no. This time, though, it took me a bit longer to read the rest of the series. In this instance, I didn’t have the time or cash to supply my addiction. The time separating the first read from the rest of the series spanned two years at least. When it came to finding the other books, it took little research. Half.com provided me with perfect prices to own the series, IN ORDER. After choosing a book at the very end, I decided to try reading it in order. Only that didn’t work either. While attempting to find the right price for the books, I bought a few that were not in numerical order. One from the beginning, two from the middle, and a few missing in between. I read whatever arrived in the mail. I don’t remember exactly what order I read them, but the reaction was the same. Joy from piecing together a story I first read years before. The details of the first book were a little hazy, but eventually everything fell into place. At the moment, I am a few pages into the final book. It’s sad to think most people never give this a shot. It’s somewhat like the idea Japanese manga has by placing the order of their books right to left rather than the normal setup. It’s a secondary challenge added on to the act of reading. You are the reader first and foremost, but you have the opportunity to approach the series from whatever angle you chose. You aren’t limited to reading it in the linear fashion we are taught. The book police aren’t going to burst into your room because you haven’t read the first book first. Take a few minutes and think of what your favorite series would be like if you read it out of order. Try taking your favorite book of the series. Start from there and see how the story would change. It might surprise you how much you take for granted reading in order. Share your story if you have ever read a series out of order! Maybe I’m not the only crazy one! What actors will they pick and will they do the characters justice? What will they sound like and how will they pronounce the names/places? Should I ever bother seeing them mess it up? Or am I obligated to see my favorite characters visualized on the screen? All of these questions are valid. My first book movie experience was the Harry Potter series and up until the third movie, I was incredibly happy with the film version. Then when the director changed and a character died, the films lost their magical connection to the books. I personally feel an obligation to see a movie made from a book I’ve read and especially loved. At the moment, I’m holding out for the movie version of Orson Scott Card’s famous novel Ender’s Game. Although nothing will replace the images inside my head it will be very interesting to see what other people envision and compare the p.o.v. after seeing the film. The idea of making a film out of a book came to me because I saw The Girl with the Dragon Tattoo tonight. Since I have not read the book before watching the movie my opinion of the characters is only based on the actors/actresses. However, I could see the holes in the plot and detail that can only be filled by the lengthy paragraphs of a novel. The fundamental question is…can a film truly capture the meaning of a novel or even a short story without using all of the information or always inside the head of the characters? For me, it’s a no. It can’t. As a writer, nothing is more involving than getting inside the head of the character and knowing everything they think and being able to have the narrator give objective information all of the time. While movies have the visual effect of showing you the entire street or the entire world of the story…and the narrator can say what’s inside the character’s head…it is never enough to completely immerse you. There is always something the director or screenwriter must leave out and most of the time that information is the most important. Let’s go back to the Orson Scott Card example. I am immediately displeased that the actor playing the main character is too old and the character does not become that age until half way through the book. I am also upset that they probably will not show pivotal scene in the character’s life (killing boys that bully him) because the film will be rated for younger kids. This seemingly innocent piece of censorship to shield children from violence is altering the entire meaning of the story. So, regardless of my complaints already I will see the movie of one of my favorite books. I feel it is an obligation to see all forms of the book and characters I love so much. But now I turn the discussion to you dedicated readers and movie buffs. What is your opinion on book movies? Do any of them do a good job of depicting the book? If so what ones and why? 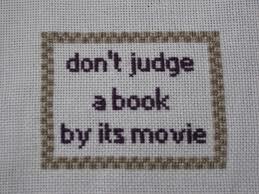 And for the haters-which movies did the worst job of depicting the book and why?